During the week of May 7 the Economic Commission for Latin America and the Caribbean (ECLAC), one of five U.N. entitles promoting economic and social development in the world, is holding its 37th biennial session, this time in Havana, Cuba. Three important opening speeches were delivered on May 8 by Cuba’s President Miguel Diaz-Canel, ECLAC’s Executive Secretary Alicia Bárcena and U.N. Secretary-General Antonio Guterres, a native of Portugal. Here are highlights of these speeches. “ECLAC correctly points out, ‘inequality has not only economic, but also political, social and cultural implications’”. “It is necessary to fight to make the theme of the Sustainable Development Agenda 2030 a reality, that is, that ‘nobody is left behind’”. As is typical for occasions like this, grandiose language is used to proclaim the objectives of the organization. Whether such language is justified, only time will tell. It was surprising to this observer to hear Executive Secretary Bárcena say anything about the U.S. embargo (blockade) of Cuba. It was even more surprising to hear her say that “the blockade costs the Cuban people more than 130 billion dollars, at current prices,” which happens to be the same amount claimed by Cuba last November in the U.N. General Assembly debate over the annual resolution against this U.S. embargo. Although the Executive Secretary said, “We [at ECLAC] evaluate it [the impact of the embargo (blockade)] “every year,” she did not provide details about the calculations or methodology that produced the amount of the alleged damages or who or what ECLAC office did that analysis. Nor did she indicate whether or not Cuban officials were involved in that ECLAC effort. Nevertheless, Cuban officials undoubtedly were pleased to hear her make this pronouncement even though it does not constitute conclusive proof of such an amount (or any other amount). Instead, it is an another allegation that has not been subjected to U.S. (or any other) analysis, cross-examination or contrary evidence. As this blog has suggested, both Cuba and the U.S. should agree to submit all of their damage claims against each other, including the embargo claim, for resolution to the Permanent Court of Arbitration at the Hague in the Netherlands under its Arbitration Rules 2012 before a panel of three or five arbitrators. These points regarding the alleged damages from the embargo (blockade) are notwithstanding this blogger’s consistent opposition to the embargo and urging the U.S. to end the embargo as soon as possible. It does not advance any real U.S. interest and obviously imposes some negative impact on Cuba. Moreover, the alleged damages obviously constitute a contingent liability of the U.S., and any rational actor should seek ways to reduce such a contingent liability, the easiest of which is stopping the practice. Other aspects of the ECLAC meeting are d discussed in ECLAC, News; Borrero, Cuba shows that economic growth and equality are not incompatible, Granma (May 9, 2018). Diaz-Canel, Cuba reiterates its commitment to partnership for development, based on mutual respect, selfless help and complementarity, Granma (May 8, 2018). Guterres, Let’s commit ourselves to continue creating, to keep working and to keep fighting for not leaving anyone behind, Granma (May 8, 2018). See Another U.S. General Assembly Resolution Condemns U.S. Embargo (Blockade) of Cuba, dwkcommentaries.com (Nov. 1, 2017). Resolution of U.S. and Cuba’s Damage Claims, dwkcommentaries.com (April 6, 2015); Resolving U.S. and Cuba Damage Claims, dwkcommentaries.com (Dec. 13, 2015). See posts listed in the “U.S. Embargo of Cuba” section of List of Posts to dwkcommentaries—Topical: CUBA. 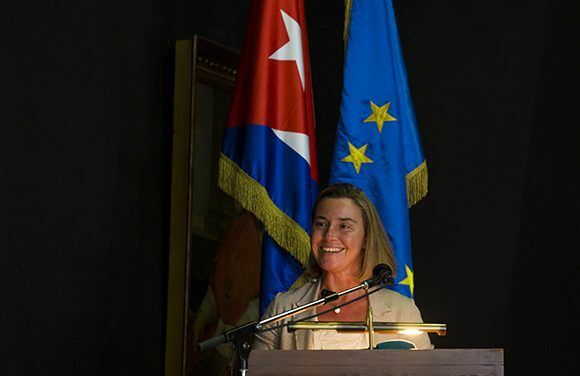 In early January, Federica Mogherini, the High Representative of the European Union (EU) for Foreign Affairs and Security Policy, conducted an official visit to Cuba to celebrate and solidify the EU’s relationship with Cuba. The visit included her Magisterial Lecture at the San Gerónimo School in Havana; meetings with President Raúl Castro, Foreign Minister Bruno Rodriguez and other Cuban officials; and a concluding press conference. Trade and trade cooperation, dealing with principles of international trade and covering cooperation on customs, trade facilitation, technical norms and standards, sustainable trade and investment. Agreement approved in December 2016 : “With the new political dialogue agreement, we have the opportunity to elevate our relations to a level that truly represents the close historical, economic and cultural ties that unite Europe with Cuba. This agreement opens new opportunities to increase our trade, our investments and to promote common solutions to global challenges such as migration, the fight against terrorism, nuclear disarmament and climate change. One example is the new cooperation program to promote the use of renewable energies that we are going to start with Cuba, especially in rural and isolated areas. On February 28 in Brussels she and Foreign Minister Rodriguez will preside over the first joint council to discuss how we can further advance our cooperation in concrete projects. Mogherini said that the EU is a “predictable and solid” partner that can help Cuba manage a political transition and slow, halting economic opening.”We are consistent and we do not have unpredictability in our policies, or sudden shifts,” in an obvious reference to President Trump’s reversal of some elements of President Barack Obama’s opening with Cuba. Mogherini expressed what every reasonable person should desire in every relationship, personal and international. The Trump Administration hostile actions and rhetoric against Cuba has provided opportunities for the EU and other nations to expand their connections and relationship with Cuba comes at the expense of the U.S. economic and national interest. Reuters, European Union Diplomat Visits Cuba to Strengthen Ties, N.Y. Times (Jan. 3, 2018); EU is interested in increasing economic operations with Cuba, says Mogherini, CubaDebate (Jan. 3, 2018); High representative of the European Union today begins an official visit to Cuba, Cubadebate (Jan. 3, 2018); Mogherini says the EU wants to strengthen economic and business cooperation with Havana, Diario de Cuba (Jan. 3, 2018); Concepción & Pérez, Federica Mogherini in Cuba: “The real strength lies in dialogue and cooperation,” CubaDebate (Jan. 3, 2018); Raúl receives European High Representative for Foreign Affairs and Security Policy, Granma (Jan. 5, 2018); Raúl received Federica Mogherini, CubaDebate (Jan. 4, 2018); Bruno Rodríguez Parrilla receives High Representative of the European Union (+ Video), CubaDebate (Jan. 4, 2018). EU, EU-Cuba relations, factsheet Previous posts about the EU-Cuba relationship are listed in the “Cuba & Other Countries” section of List of Posts to dwkcommentaries—Topical: CUBA. Mogherini: the blockade is not the solution, Granma (Jan. 4, 2018); Federica Mogherini in Cuba: “the real strength lies in dialogue and cooperation,” CubaDebate (Jan. 3, 2018). Reuters, EU Presents Itself as Ally of Cuba in Face of US Hostility, N.Y. Times (Jan. 4, 2018); Remarks by High Representative/Vice President Federica Mogherini at the press conference during her visit to Cuba, EU External Action (Jan. 4, 2018); Mogherini: The EU has become Havana’s main trading partner, Diario de Cuba (Jan. 5, 2018); Federica Mogherini: “Cuba and the European Union have raised their relations to a new level,” CubaDebate (Jan. 4, 2018).